The holidays are just around the corner! Don’t you just love this time of year? Grumpy people seem to be happier. The weather is crisp and cool. Cheery decorations are everywhere you look. I’d be lying if I said it wasn’t one of my favorite seasons. So in the spirit of Christmas I wanted to share an addicting cookie recipe that makes a great holiday treat that you could easily gift as well! 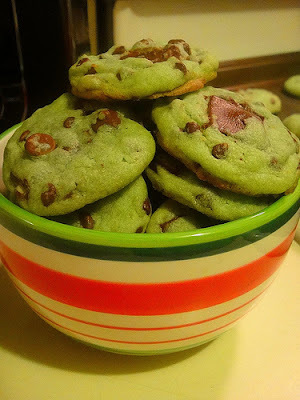 I was so eager to make these Mint Chocolate Chip Cookies when I stumbled upon the recipe on Pinterest (most amazing website ever, it’s a baker’s dream!) that I couldn’t wait until Christmas, so I made them for Thanksgiving. Mr. Sugarcoated teased me a little for this because he said the color of the cookies reminded him of Christmas and NOT Turkey Day. I ignored him and my family was very appreciative that I did. They LOVED these cookies. 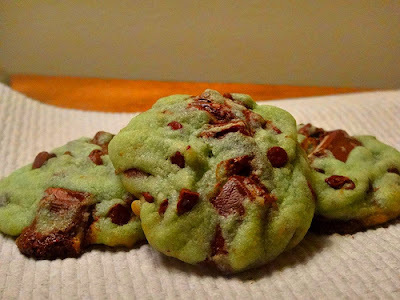 The fusion of mint and chocolate into a tasty sugar cookie is a masterpiece. Plus they are GREEN! (I’m a sucker for colored baked goods) The recipe is super easy to follow and it makes a ton of them so you could easily bag them up in some cute holiday wrap and send them over to your neighbors! Genius, right? You should hop on this gravy train, people. 1. Heat oven to 350 degrees. In a large bowl, stir cookie mix, butter, mint extract, food coloring and egg until soft dough forms. 2. Stir in Andes mints and chocolate chunks. 3. Using a small cookie scoop or teaspoon, drop dough 2 inches apart on an ungreased cookie sheet. 4. Bake 8 to 10 minutes or until set. Cool 3 minutes and remove from cookie sheet. Store tightly covered at room temperature. yeah, they're in a christmas bowl. i got excited. I've seen these on Pinterest too and have always wanted to try making them. I could never fin the recipe... until now! Thanks Tori! These are being added to my christmas cookie list! !